This statement is all too commonplace in the football arena. This phrase can be defined by the dispute that occurs over theoretical situations drafted on the chalkboard in the locker room between coaches and/or players. As the saying goes, whoever possesses the chalk at the end of the conversation is right. Always. If you are a consistent reader of my blogs, you know that I grew up in a locker room. I mean I literally spent my childhood in high school and college locker rooms. I can remember my fascination with the sport of football from the very beginning. My dad was (and still is) a coach and I wanted to spend every minute I could with him. As a result, I was exposed to many conversations about strategy starting at the age of three. 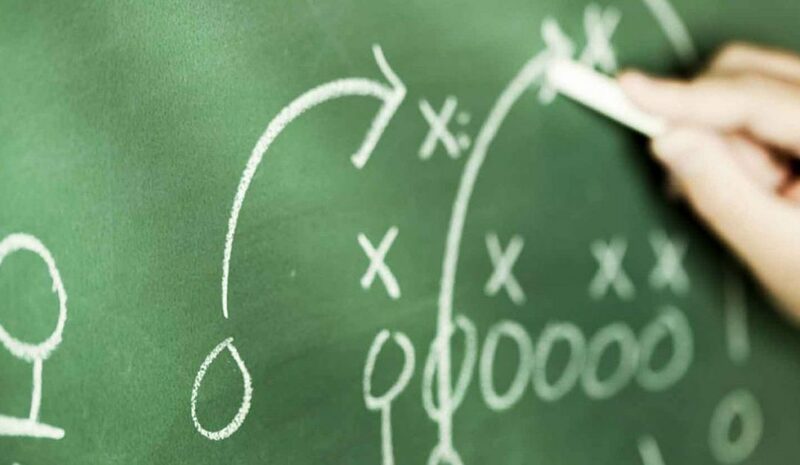 I used to love drawing plays on the chalkboard as a young kid trying to mimic my father and the other coaches. By ten I became quite skilled at the X’s and O’s of the game of football. During those long nights in the locker room, I would often hear the coaches debate strategy for the next opponent. They would discuss the plays that should be incorporated into the game plan and which ones should not be. Believe me when I tell you that I witnessed plenty of heated exchanges. Just as I did at the time, I continue to find it compelling that in the quest for success we can be blinded in search of the “perfect play.” There is a fine line we tow of making things way too simple or way too hard. The answer, however, always comes down to your personnel. Do you take advantage of what THEY do well? How are you developing their strengths? Think about it. What is more important as a leader in an organization? Having the chalk last or having the strategy work?